Previewed last September at Paris Fashion Week, the coveted FENTY x PUMA Spring-Summer 2017 collection hits stores starting 9 March 2017. The Spring-Summer 2017 collection fitting for the season stuns in a mélange of extravagant fabrics, intricate ruffles and pleating, Chinoiserie, corsets galore, playful bows and gender bending silhouettes in a delicate colour palette of blush, mint green, lavender, pink and white. PUMA’s sport heritage echoes through as Rihanna brilliantly reimagined and transformed traditional track suits, boxing robes, tennis dresses, polos and iconic footwear silhouettes. Maximalist at best, she played up with exaggerated and oversized shapes and contrasted soft hues with hard edged street-inspired looks for both men and women. First to release are head-turning footwear styles that caused a ruckus in the fashion world when they first graced the Paris runway. The FENTY x PUMA Bow Slides in olive branch and silver pink elevates lounge and poolside wear to a whole new level with the softest leather material and statement oversized bow. 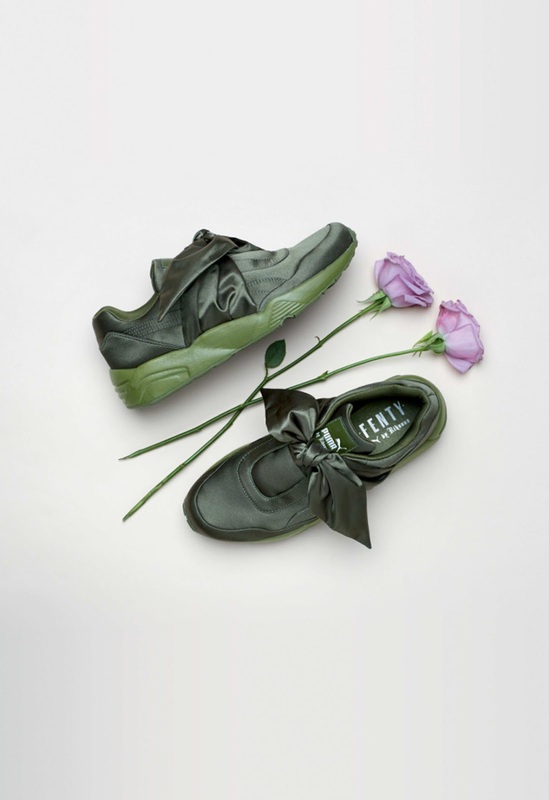 The theme continues with the FENTY x PUMA Bow Sneaker, a femme fatal hybrid of PUMA’s iconic Trinomic runner also in olive branch and silver pink. The FENTY x PUMA Bow Sneaker and Bow Slide will be available from 9 March at PUMA SELECT Bree Street, Cape Town and selected retailers.